With some detective work, you can determine whom you want to reach and how you’re going to engage them on Facebook. In this article I’ll share five questions to help you identify and connect with your target customers on Facebook. Buyer personas are an integral part of any successful marketing, whether traditional or social, because they clearly define your target customers. 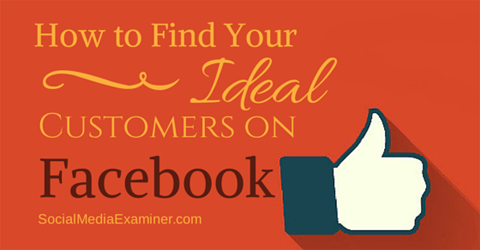 Find out how to find your ideal customers on Facebook. What type of people do you want to do business with? What do they look like? Where do they live and how old are they? To create a persona for the customer you’re after, jot down the demographics and your additional notes that answer those questions. If you have more than one target demographic, you can repeat this exercise for each customer type. Now, look at your Facebook Insights to see if the customer demographic profiles you’ve created match the demographic profiles of the people liking, sharing, commenting and following you on Facebook. Identify your target customer personas. Image: Shutterstock. The young Australian male surfer, 13 to 25, who lives to surf and doesn’t live more than a mile from the ocean. His work fits around his surfing lifestyle, not the other way around. He cares about the environment, and lives and breathes surf culture. The young Australian female surfer, 13 to 25, who is hitting the waves on a regular basis. She’s grown up with surfing and loves the surfing lifestyle. Her whole family surfs and so do all of her friends. The Australian mom and dad surfers, 35 to 45, who are active in the surf schools and competitions and take the kids out for a surf on a regular basis. 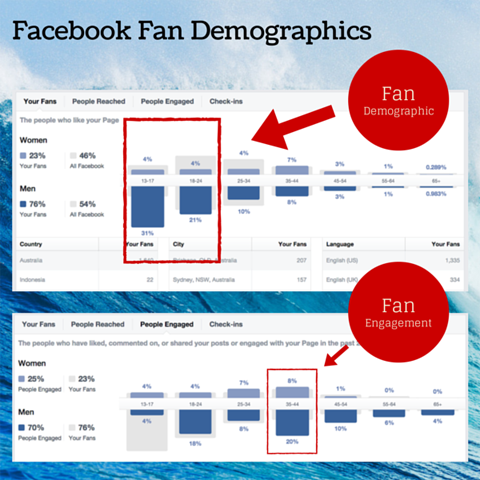 A look at the company’s Facebook Insights reveals that their primary Facebook fan demographic aligns with their first two target customer profiles. CTRLV wants to reach avid young male and female surf culture enthusiasts, and they are—52% of their fans are in that target demographic. Insights also shows CTRLV that their third demographic—moms and dads ages 35 to 44—make up only 8% of their fan base. This suggests that CTRLV may want to consider optimizing their page to appeal more to this demographic group. Check social media analytics to see if your target customers are also your fans. Interestingly, when looking at which fans are most engaged, the 35-44 age group wins hands down. What does this mean? It indicates that the company may need to tweak their posting tactics in order to reach more buyers. If you find that your buyer personas and fans aren’t aligning or engaging as you suspect they should, make adjustments as needed. That becomes easier as you answer the rest of the questions in this article. #2: When Do Our Target Customers Use Facebook? People’s lifestyles, interests and habits influence how, why and when they use social media. Understanding those influences and behaviors helps you avoid ineffective posting tactics (e.g., throwing up posts at random times and hoping for the best). Going back to CTRLV, they know their primary target customers are surfing first thing in the morning and again in the late afternoon, depending on the tides and swell. These customers are most likely to look at Facebook when they’re checking the surf conditions or when they’re done surfing for the day. Check your post Insights to see when your buyers are on social media. A look at CTRLV’s Facebook Insights reveals when their updates received the most engagement. In this case updates have done well in post-surf time slots, but not that great in prime surfing time slots. When you compare your target demographic with the times they’re most engaged, you’ll find patterns that help you set up a publishing schedule that reaches the people who are most likely to buy from you. #3: What Motivates Our Customers to Connect With Us? It’s easy to look at your social posting through your own goggles. You know what’s interesting about your business, right? Well sure, but your ideal buyers may have other issues and concerns that aren’t obvious to you. If you want them to connect with you, it’s worth digging deeper to find out what matters to them. With a little research, CTRLV found that their target buyers aren’t consumerists by nature, but are driven by other values: lifestyle, a passion for the perfect wave and community. 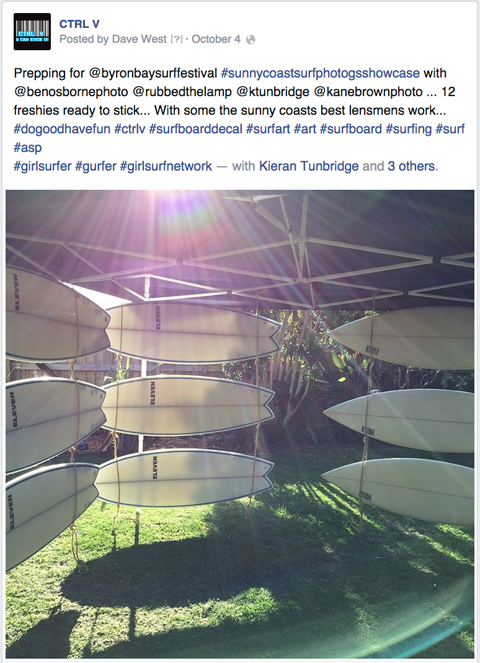 CTRLV tapped into that passion by highlighting the company’s support of surf community events and causes. Tap into your ideal buyer’s motivations, needs and dreams. To find out what matters to your own target customers—and to get them to connect with you—do some ethnographic research. Follow conversations on blogs, in groups, communities and social media chats that relate to your product or service. Listen, then craft updates that cater to those passions. #4: Where Do Our Customers Go for Answers? You can get an idea of what news sources your ideal buyers rely on simply by doing a graph search on Facebook, or a hashtag and topic search on Twitter, LinkedIn and Google+. Whichever platform your ideal buyers are using to find answers, you’d better be there too—front and center. CTRLV’s ideal buyers are into surfing to such an extent that they get all of the surfer mags, read the surf blogs and check in to coastalwatch.com daily. 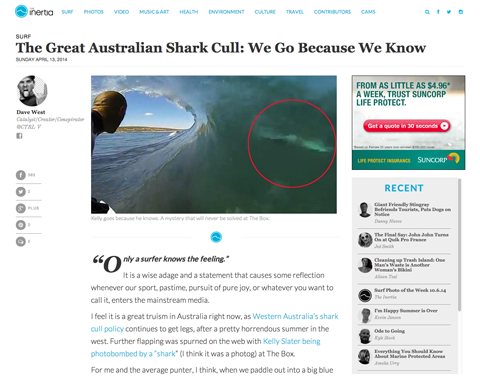 It made sense for the company to focus on reaching out via surfing magazine platforms. CTRLV has guest blogged on a few magazine websites and so far the response has been terrific. Know where your buyers are looking for information and make sure you’re part of that resource. This post on The Inertia website resulted in more than 350 shares on Facebook. The other really cool thing about this is that CTRLV can now clearly see that their audience is on Facebook. Check out the number of shares to other platforms—hardly any! Understanding where your ideal buyers go for more information helps you develop additional content aimed squarely at them on the platforms you know they love. #5: Who Are the Influencers Our Customers Follow? Aside from media, your ideal buyers look to particular leaders for inspiration and information. Do you know who those people are? Are you connecting with those heroes and influencers? To find the most important influencers to your audience, look for hashtags and Facebook pages on a particular topic (graph search is a good place to start). You can also look at Twitter lists, groups and communities. Be a fly on the wall within a social media page or community and see who stands out. Who are the everyday influencers and who are the heavyweights? Once you’ve identified the heroes your ideal buyer looks up to and follows, you can start following those influencers and interacting with them too. Find out which heroes and influencers affect your customers. In CTRLV’s case, finding influencers was easy. In the surfing community the heroes are the sports stars and the up-and-coming stars, as well as photojournalists and filmmakers who focus on surfing. 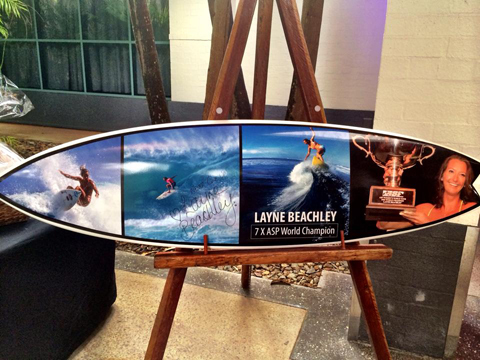 This year, CTRLV connected with a number of key influencers including women’s surfing champion Layne Beachley. Sharing that connection (and others like it) on Facebook attracts their primary target audience to their Facebook page and encourages likes, shares and comments. Research doesn’t have to be difficult, costly or time-consuming, but it’s vital to your success in business. Asking and answering these five questions streamlines and focuses your marketing efforts. It doesn’t matter if you’re working solely on Facebook or handling accounts on multiple social networks—each platform has the analytics you need to find your way. What do you think? Have you defined your target customers? How are you reaching them on your social networks? Share your thoughts in the comments below. User avatar photo from Shutterstock.